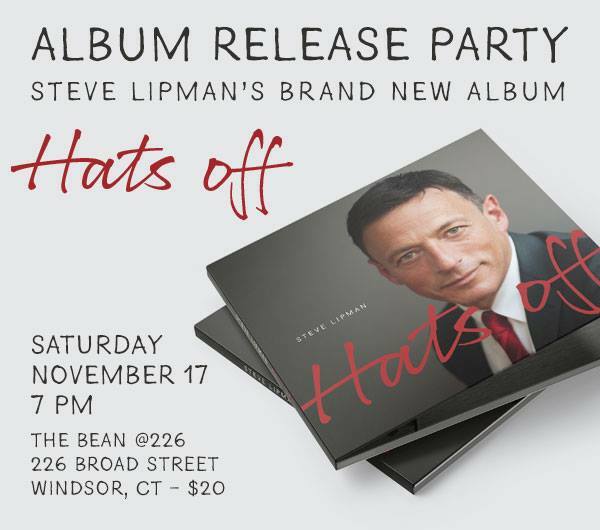 On Saturday November 17th at 7pm at The Bean @226 in Windsor, CT, I will be hosting a party celebrating the release of my brand new album, Hats Off! Hats Off is a compilation of music drawn from the Great American Songbook and much, much, more. The album passionately reflects my journey; the birth and evolution of my soul in music. With phenomenal arrangements by Dan Prindle and Nick Borges, and outstanding editing/mastering by Nate Christy and Mark Alan Miller, Hats Off is a body of music that will truly delight even the most sophisticated music aficionado in this genre! I will be making a live appearance that evening. Musicians joining me for the performance will include John Brighenti on piano and Dave Daddario on bass. In addition, Dan Prindle and I are planning some special musical surprises that you certainly will not want to miss! Due to limited capacity reservations are highly recommended. Part of the proceeds will be donated to the Save the Music Organization. PLEASE JOIN US AS TOGETHER WE CELEBRATE A YEAR LONG ACHIEVEMENT!